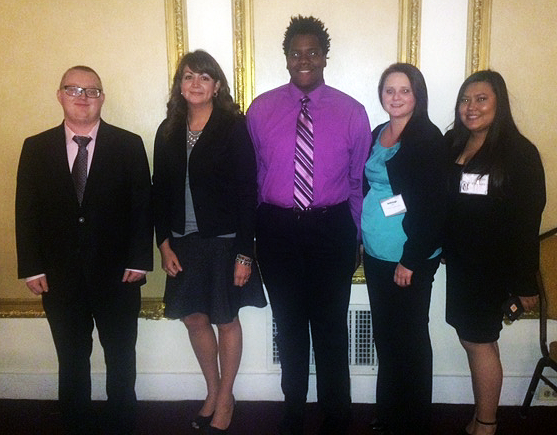 The Cowley College DECA Officer team of Alexis Phakornkham, D’Abreian Bush, Austin Hendrickson, and Ashleigh Huck participated in the National Collegiate Leadership Academy Conference held in New York City, November 11-15. During the conference, the students were able to engage in conversations with corporate executives, participate in behind the scenes tours and gain industry trends and insight in the career tracks of their choice. Each student chose one of the following career tracks: advertising, fashion merchandising and retail management, hospitality and culinary arts, international business and finance, or sports and entertainment marketing. In their perspective career tracks, each student was placed on a team in which they participated in a case study competition that culminated with presentations to DECA’s National Advisory Board Members. In addition to the case study competitions and presentations, the Cowley DECA leadership team participated in and listened to various speakers that discussed topics such as dressing for success, how to give an effective speech and possible internships. DECA vice president D’Abreian Bush said the conference showed the students how to problem solve with a group of people from other states.